Spring has finally sprung here in northern NY (although we are not planting our beds until after Memorial Day…just in case!) The array of local food is expanding weekly. For today’s feature, we have brought together many local ingredients. Black Angus tenderloin skewer with bourbon-peppercorn sauce. Chicken breast with wild leek pesto sauce. Local Sweet Italian sausage with Worcestershire. caramelized onions. 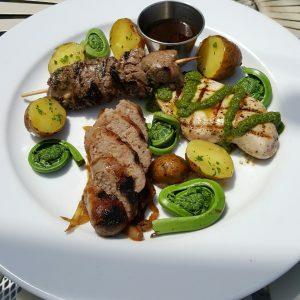 Drumlins End Farm German butter ball salt potatoes and Raquette River fiddle heads.